The Wax-lip Orchid is Glossodia major, flowering from spring into early summer, the flowers are usually a mauve to purple colour fading as they age. 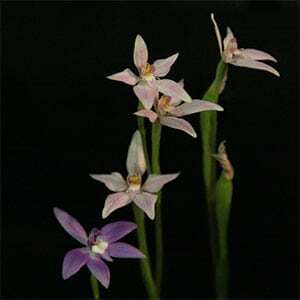 This is a terrestrial orchid, its natural habitat is in open forested areas to woodland clearings. The flowers appear on tall stems as single blooms sometimes in pairs. The foliage is at the base, broad leaves covered in fine hairs. Somewhat difficult to grow in cultivation as it seems to rely on fire to push it into its flowering cycle. This is an orchid that has a wide natural distribution, from South Australia through Victoria, Tasmania and New South Wales. It is possible to grow Glossodia major however is is difficult to find. 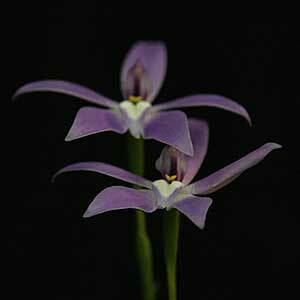 Like many Australian Native Orchids this is species that does not transplant well. It needs to stay in the one position. Disturbing the plant usually results in it dying. Postion – Full sun to dappled shade. Flowers – Waxy purple to mauve although variable with some white flowering varieties. Foliage – Mid green, lance shaped and basal in habit.